One of the funnest events in cub scouting is the pinewood derby. 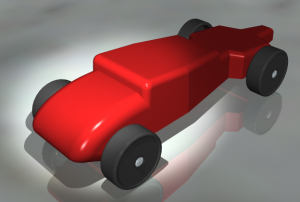 Below are free plans to pinewood derby cars I have found to be very successful. My personal recommendation is the Flying Wedge. It is not the prettiest car, but I think it has the best chance of winning (which, of course, is not everything). Before you begin your car, be sure to see our page on Speed and Construction Tips. Feel free to ask questions about the plans. I would love to post pictures of your car in the Pinewood Derby Photo Gallery, just send them to pinewood@boysdad.com. All of these plans are completely free and are designed for easy cutting with an ordinary bandsaw with a narrow blade. Please NEVER allow a child to operate a bandsaw. Each car design has 2 files associated with it. 1) An engineering drawing with accurate mass properties, and 2) a template that you can trace onto the pine block as a cutting guide. The links for both files appear below the picture. You can click the picture for a larger view of the design. 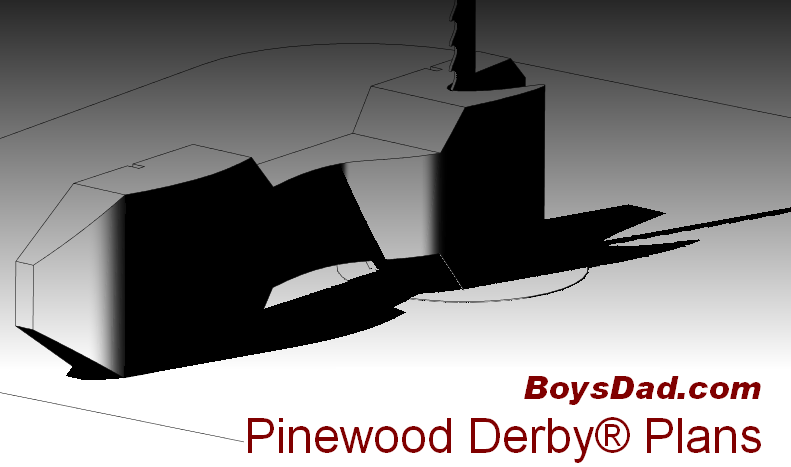 This is a full size template of the current Pinewood Derby® block that will allow you to design your own car style. The axle slots and an outline of the wheels are included. This insures you will have a unique design. Taking design cues from winning Indy car models, Bond offers a combination of style and speed that is hard to beat. The rear of the car offers generous room to drill for lead or tungsten weights, while the front is an aerodynamic wedge that cuts through the wind like a knife. Definitely a showstopper. With its high rear spoiler and aerodynamic styling the Fonz looks like it is ready to take on the toughest competition. The Fonz allows for a rearward weight distribution concentrated just forward of the rear wheels. Short on style but built for pure speed the Flying Wedge is the car I have won more races with than any other. The style of this car has evolved over the past several years into an extremely consistent performer. With near perfect rearward weight distribution and adjustable weight lugs, the Flying Wedge allow for last minute weight adjustment that is critical to winning. With styling reminiscent of a 33 coupe, the Hot Rod is a real beauty. This car can be a real heart throb when you take the time to sand the curves smooth. If you are a real craftsman, the Hot Rod can be a real work of art. The real “bad boy” of the racetrack, Luthor brings ’70s styling to the modern Pinewood track. Luthor is another car that is built for speed. Many of the enhancements that the Flying Wedge uses can be incorporated into the Luthor body style. The flying wedge pinewood car has two 3/8 holes for lead weights. How deep do I drill these two holes? On the flying wedge design I was wondering are the 2 3/8 drill holes thru holes or do they only go a certain depth…the design is reall cool but that was a part I wasnt sure of. They are thru holes, but you will need to plug one end up when you pour the lead (I use aluminum tape). My son and I used this plan for a winning car last year. 1. Drill these holes while the car is still a full block. We waited til we were ready to paint to drill the holes. Even by gradually increasing the width of the bits used to get to 3/8 inches, once we got near the end we could hear the wood beginning to split and saw a hairline fracture. This year, I drilled the holes before making any cuts. The extra mass in the block prevented cracking from happening when using the wider bits. Great, simple design. And very clever idea to use a bolt to provide adjustable fine tuning. We found the nuts we used provided 0.1 oz. increments. Hope this helps – I’m just a normal dad so if some of this is obvious…well…what can I say. Thanks and happy racing all. Did you put lead into the two 3/8 holes? The holes go completely through the car body, and they should be completely filled with lead. I usually only had to add a couple of nuts and washers to get to 5.0. 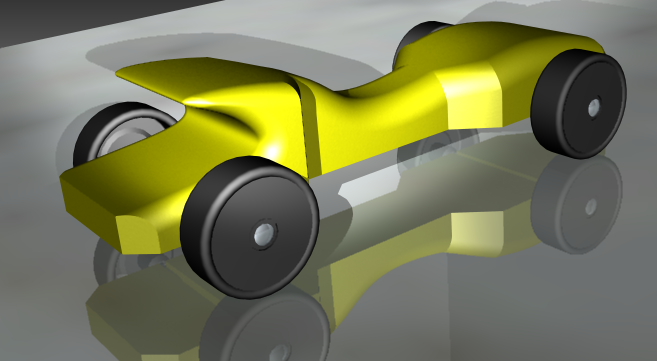 I just wanted to send a big thank you for your pinewood derby info and designs. My son used the “Flying Wedge” design in his first Pinewood Derby and won 1st in the Wolf division (he’s 7) and 6th overall! He was so happy and smiling from ear to ear. We also had trouble making weight so we added lead weights into the shallow cavity in front of the screws underneath the car and filled it up with wood putty. I cannot believe how close the races were – first place was only 0.02 seconds faster than our car! Now that we have gone through it once, there are so many things that we have in mind for next time to improve our speed. The nice thing was that it was fun for everyone and all the boys were good sports – some of his buddies actually came up to him and congratulated him on his victory. It was also an excellent father son bonding experience for us. We both had fun working together and using the tools. Finally, the top 7 cars get to go to the district meet and my son is excited to go. Thanks again for all your great info and designs! Fantastic! Glad to hear the good news. Thanks for the Fonz plan. My son won the tournament! I built that last night with my son and he raced it today. He was a pretty good sport about it…he never lost a race…wasn’t really even close except for the last race. I did have to run to Hobby Lobby and buy a 2 oz fuselage that I placed along the scoop and almost 1/2 oz flat weight underneath the back axle to get to the 5oz limit. On the flying wedge design, what is the best way to hollow out underneath for the screws? I use a milling cutter or router bit mounted in my drill press (I have an “XY” table mounted on the drill press). Another way to do it is with a router table. You would need to use a jig to make the rectangles to the right dimensions. If you don’t have either of these, you should probably ask around for somebody who does. I have heard people recommend using a Dremel tool to do it, but I don’t recommend that. Thanks sooo much my son and I made your “Flying Wedge” we did have problems getting it to 5oz so we drilled two more holes on the under side rear axles and a little more in front of the screws anyway after all that hard work he won, he got first with and avg. time of 2.6 thanks again oh and buy the way this was are first build. Awesome!! Thanks for letting us know about your success. I’m having a heck of a time trying to figure out how you cut the bottom compartment into the car. Do you have any tips on how you did that? I have a band saw and drill press, but nothing would really result in a nice flat bottom. The only think I can think of is to cut the compartment all the way through the sides with a band saw, and then cut replacement sides and glue them on. I hope there is a more simple solutions. I’m so confused! I was going to do the flying wedge and can’t even get past the first part! It shows cutting off 3/8 off the back and then ??? You’re glueing it to the front? Am i interpeting this correctly? Sorry, i’m a widowed mom of 3 boys and I’ve never done this before. I am more than frustrated. What you want is to get the center of gravity toward the back of the car, but not too far back. If you have a simple wedge shape with the weight in the back and you get your weight very close to 5.0 ounces, you will do well. Make sure you clean up the nails (axles) and push them in (don’t hammer them in). Don’t sweat the details, our plans are for the obsessed. My son is a Tiger Cub and he selected the Luthor design for his first car. It was simple to build and with the exception of the bandsaw cuts, he was able to do the whole car himself. We just finished our race and he was UNDEFEATED! Now we’re on our way to the District races! Hi Rob – I love your site, thank you so much… single mom of a wolf, I am also confused on placement of the weights for Luther? and tips on this? Thanks!! I need a little guidance on how to cut out the bottom of the car. What tool(s) do you recommend for this? How much space should be left on the side. The plans seem very straightforward for the rest of the car, but the underside has me a little perplexed. Thank you! Great post. I was wondering if you have the 3d model of the base block , wheels and nails? Thanks for posting the wedge plans. It looks like a lot of fun, and we can’t wait to get started! Great designs! There are a couple websites that recommend leaving one of the front wheels off the track (basically placing the axle a little higher than the other three wheels.) What are your thoughts on this? Is that legal? My son wanted to make a fast car this year. He kept talking about last years winner and how it looked like a wedge. I saw your Drawings and showed him. He is soooo excited. Thanks you have made my son happy and made it a little easier for me. He is already talking about painting lightning bolts! I was working with a little boy who lost his dad two years ago. I asked him what kind of car he wanted to build and he told me one that wins! I searched the net and found your site on the flying wedge. We followed the plans to the letter and he won every race he was in today!! He is sooooo excited!! He is now going to the district race. Thanks for posting this design. This surely took the pressure off considering I did not want to let him down. Thanks for providing the information so that I was able to deliver. He is already making plans for next year!! I hope we can do a repeat performance!! So awesome! Thanks so much for letting us know. Just wanted to tell you thank you so much for all the information on the site. I am a single mom and had to help my tiger son build his first car. We used the Luthor design and he won every race and went on to districts! He was so excited that he doesn’t want to make another one this year since that one did so well. I was extremely excited also because the car beat the reigning champion, all time fastest favorite car in our pack.! On the cut out underneath the car…. Do you have to fill that in with wood putty to be legal or can you just leave the bolts exposed and visible? Also what size are the bolts? I printed the Luthor template, but it’s not to scale (axles don’t line up) so I can’t really trace it onto the wood. What do I need to do to print it correctly? We’re already behind since we missed the pack clinic today. I’ll be holding the block between my knees and cutting with a hacksaw. Wish me luck! The first thing is to make sure your printing to “full scale” or (1=1) instead of printing to “fit” (the paper). If this is what you are doing, and the scale is still off, measure the width of the printed car. It should be 1.75 wide. If it is not, divide the actual width by 1.75. This is the scale to tell your printer to use. For example, if the printed car measures 1 7/8 wide, divide 1.875 by 1.75 and you will get 0.9333. Now print using .9333 as the scaling factor (or 93%). We have the pinewood derby coming up and my 2 grandsons are each building a car, #1 is the fonz,#2 is the luthor, and my question is where do I put the weights, and what type of weights are the best. You want the weight as far back as you can get it without the car doing “wheelies.” Tungsten is the best (see amazon.com) lead is great but toxic. The easiest thing is to get a set of screw-on or stick-on flat weights from hobby lobby or the scout shop. See http://boysdad.com/archives/3306 for what I think is the very best arrangement. I am still waiting for a reply to the question I asked about weights to location on the Fonz and Luthor since it doesn’t show on the print. Please find the reply in the comments above. Here is what I said: You want the weight as far back as you can get it without the car doing “wheelies.” Tungsten is the best (see amazon.com) lead is great but toxic. The easiest thing is to get a set of screw-on or stick-on flat weights from hobby lobby or the scout shop. See http://boysdad.com/archives/3306 for what I think is the very best arrangement. We built the Bond car a couple of years back and took first place. Not bad for a newbie. We were thinking of trying one of the other designs just to keep things interesting. Thanks for posting these. Except for the “Flying Wedge” all of the link to drawings and templates for other car designs are dead. Where have they been moved to? Plans were great. My kids won all their races and took first place. Car did seem to pull to the left a bit and I could not correct, but it did not slow us enough to be caught. Lots of fun to watch video of our car really leaving others behind after hitting the flats. Thanks for the ideas and plans. Wanted to look at other designs for our next races, but it says “page not found.” Is their a link to another page to get those other plans? Thanks in Advance. Is their a site to upload video of the race? Can you paste the URL of any link that is not working here in the comments? I can’t seem to find the ones that aren’t working. If you send us the YouTube Link to your race, we’ll put the video up in the gallery. This is our 3rd year. This year my son said he wants a “fast” car. After much searching, I found your guide for the Wedge. After reading it, it seems fairly straight forward. We will be building this one this year, following your guide. Only issue I can foresee is hollowing out the weight chamber. Wish us luck!! 1. In our area the position of the axles can’t be changed(1-5/8″ and 1″). Any recommendations on how this changes the position of the 3/8″ holes for the weights on the flying wedge? 2. I don’t see any locations for drilling the 3/8″ holes for the Fonz. Do we drill holes or glue the weights into the backside of the cutout area? On the flying wedge why did you glue in machine screws instead of using tungsten cubes? we as well cant change the axles and we are building the Luthor. Any idea how far forward we need to put the weights?